Webgo Review 2019: Is Webgo a Good Hosting? German website hosting company Webgo offers feature-packed plans that are expensive but come with generous payment terms including a six-month free trial and a 100% money-back guarantee. 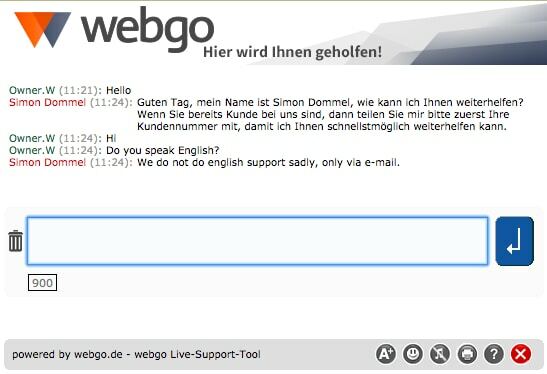 Webgo was founded in Hamburg, Germany in 2004. This award-winning company uses 100% green energy and works with 350 internet providers in 40 countries. Its comprehensive (even overwhelming) website is in German. Beginner webmasters will be pleased to see a one-click installer, but only for a small selection of programs such as Drupal, Joomla, Magento, MediaWiki, osCommerce, and WordPress. Expert users will be pleased to see support for PHP (versions 5.6 through 7.2), Python, and CGI/Perl in addition to the usual FTP, MySQL, and phpMyAdmin. Also, SSH, SFTP, and Cron jobs. For shared hosting, you can choose either an SSD RAID 10 configuration (faster and more expensive) or HDD (slower and cheaper). In either case, your feature-packed plan will use the Linux operating system. Webgo uses a German data center with redundant fiber connections and routing equipment, and a 400 Gbps+ backbone to ensure that your content is delivered quickly. This center has 24/7 monitoring and security, and it uses 100% clean power. It offers an 99.9% annual uptime average. You automatically get six months free when you sign up for a hosting plan, but beware the high price hike once to reach the seventh month. Personally, I’m not sure it’s worth the high price, so be sure that you’re sure about amortizing the total cost over the course of a year. You needn’t worry too much about your initial commitment, though, since there is a 100% money-back guarantee. This vendor’s entire website, and especially its checkout flow, is very overwhelming, so signing up can be quite confusing. Several long forms need to be filled out before you can activate your hosting plan, and you’ll need to navigate through a lot of other products and free trials en route to your final purchase. Since Webgo’s website includes so much information, I’m surprised to find only an FAQ page and no additional self-support documentation. Webgo provides feature-packed hosting packages at a high price but with a 100% money-back guarantee and six-month free trial. Webgo can also help you “go green” thanks to its use of 100% gree energy. Wondering how Webgo stacks up against other Web Hosting companies? Enter any other Web Hosting company and we will give you a side-by-side comparison.